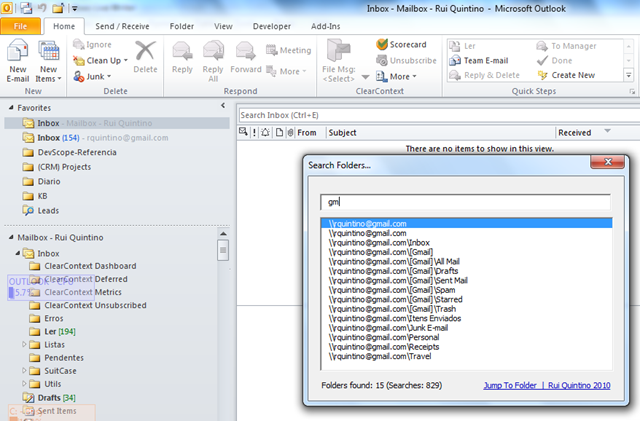 Maybe you use some “GTDish” mantra, maybe you just like to store your work/personal mail in proper folders, maybe you use a auto filling tool like the awesome Clear Context Add-In… maybe you use Microsoft CRM for Outlook… In the end you’ll have lots of folders, wasting lots of time to browse to the folder you’re looking for. 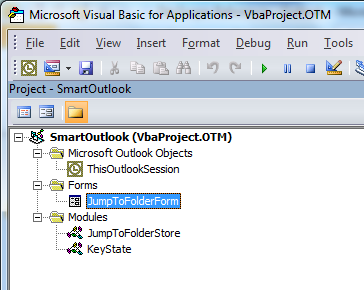 Enter an old, almost forgotten, friend: VBA, Forms & Outlook Extensibility! 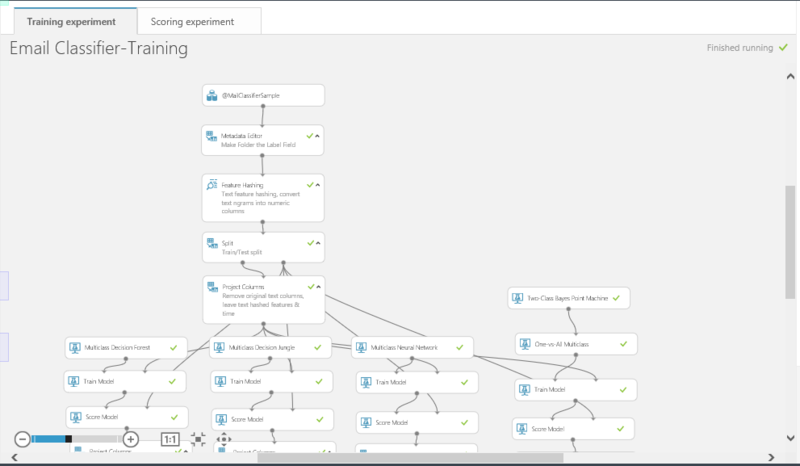 So with a lo…little copy paste from scripts I found, a little tweaking, almost none optimization… and that’s done. 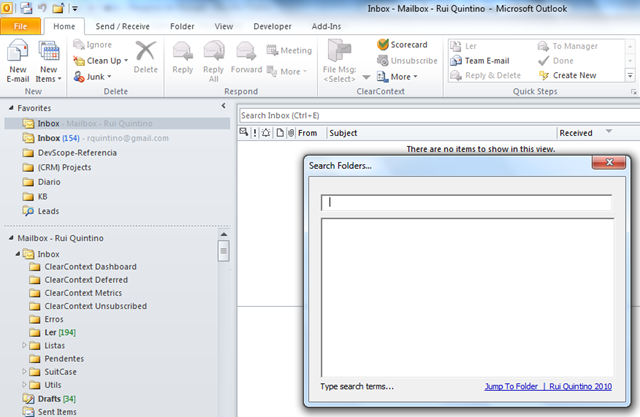 That was really the end of endless and frustrating outlook folder searching for me! 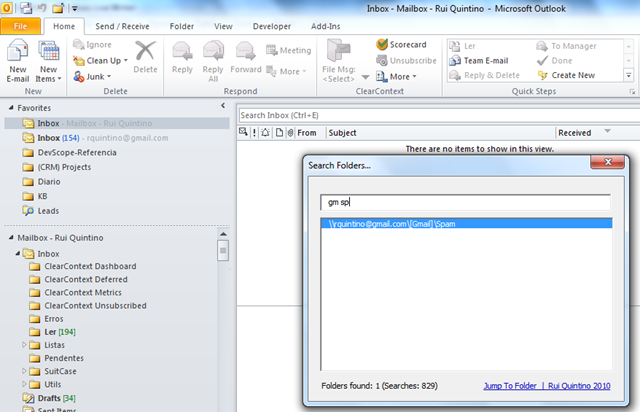 Just press alt-3, type the search words for the folder you’re looking and press enter. That simple! 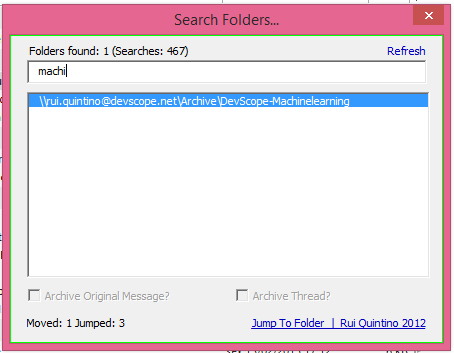 The search box is live, working as you type. 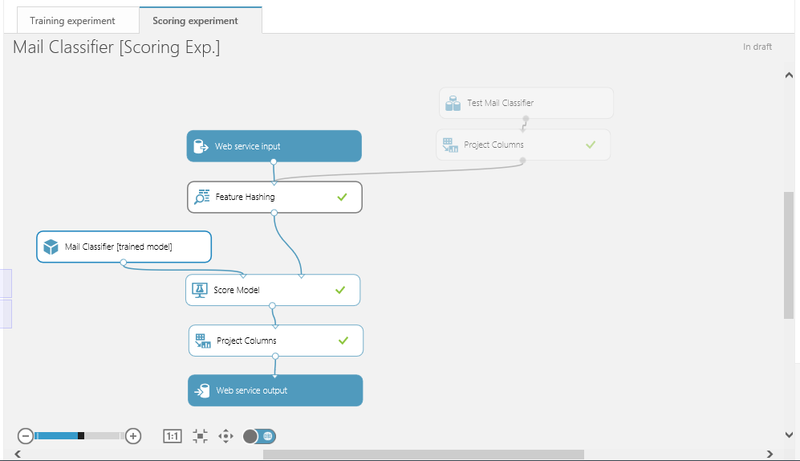 Best of all, it’s free and with (average quality I’m afraid… :) ) source code available. maybe it’s some Gmail folder..? 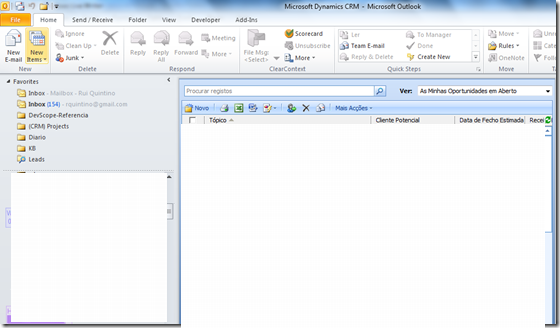 or even some Microsoft CRM for Outlook folder? So now press enter and it’s done!! 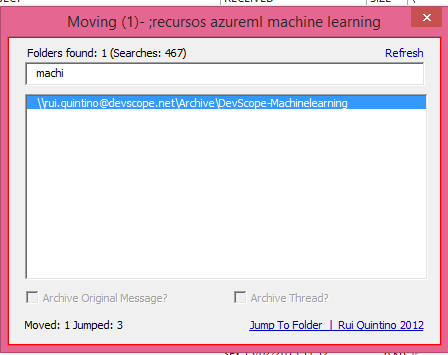 Fast as needed on my laptop, with aprox. 800-900 (….) 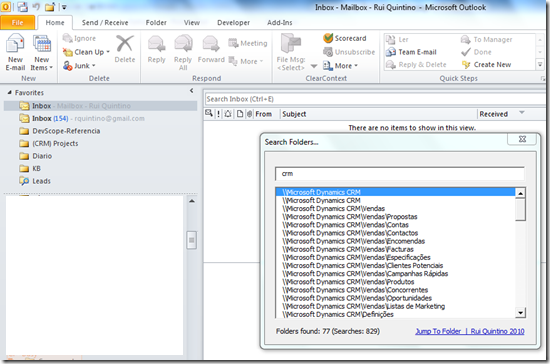 folders from Exchange Mailbox, local pst archives, gmail isapi and CRM Add-In folders. Need an hot key? 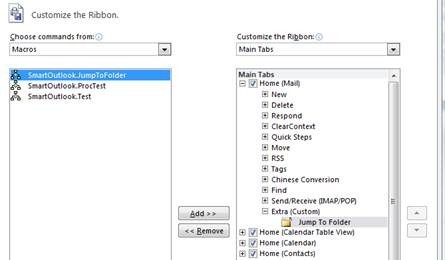 Just add it also on quick access toolbar! Now just press Alt-3 and you’re done!! So that’s it for tonight. 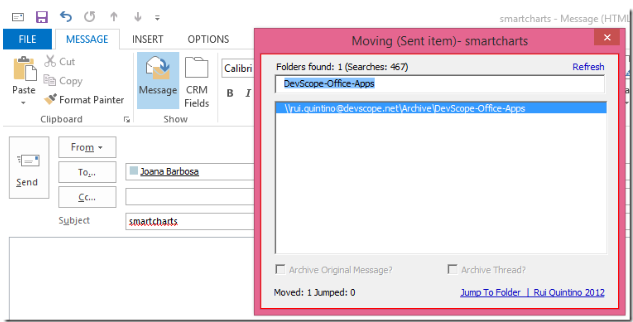 I must say that this feature was inspired by QuickJump for Windows (awesome tool, worth every $ I’ve paid) and like a good companion to ClearContext for Outlook.